Every carpet cleaning shall keep themselves upgraded with latest techniques and technologies. That being said there are a certain carpet cleaning equipments that are universally required by Carpet Cleaning Companies anywhere in the world. We list out the same for you. Make sure you have these things handy and know the proper usage of the same. Brooms: Brooms these things that are so regularly found in your household. 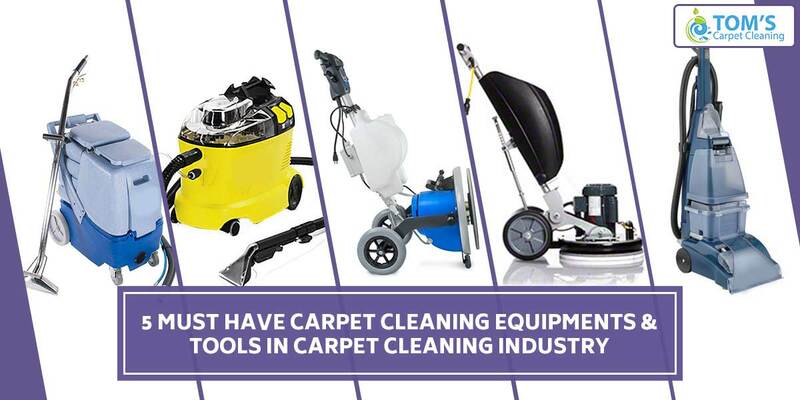 These are the most common tools that the carpet cleaning professionals will bring with them when they come for carpet cleaning to your residence or offices. You also need different types of broom depending on the area that they need to cover. Their function remains the same that is just to swipe away the top layer of dust and grime so that deep cleaning can be manifested later. Vacuum Cleaner: This electronic equipment might sound like basic carpet cleaning equipments, but it is the must have tools to have. It is also one of the most powerful for the professionals to have. It is mainly used for multi-surface cleansing (works on all surfaces) it removes the toughest of dirt and dust from the carpets. Deep cleaning of carpet is possible by only Vacuum cleaners. Steam Vapours: Best equipment for stubborn stain removing used by professional carpet cleaner. The stains found on the carpets made by your food or your pets are the toughest to remove. It could be worse if they have been catching on for a long time. Do you know that steam has more temperature than fire? This high temperature helps in killing the bacteria on the carpet, it also penetrates the upholstery and also the removal of stains. Since this runs mainly on water, it does not damage the surface. Cleaning Agents: Using the correct cleaning agents is very necessary for deep carpet cleaning. Carpet cleaning professional service providers select cleaning agents in accordance with the material of carpet. The cleaning agents companies have earned a bad reputation as they have a higher probability of causing damage to the carpets if used in wrong quantities. Carpet Cleaning Companies like ours, Toms Carpet Cleaning Services in Melbourne use 100% all natural cleaning agents. That are good for both the environment and you. Carpet cleaning wand: This is a specialised equipment that is used by the top professionals running high end businesses. It has primarily has a jet cleaning system with a long head that ensures cleaning to even the toughest corners and niches.